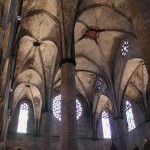 Santa Maria Del Mar is one of the most beautiful churches in Barcelona, and it is from the 14th century. It was built between 1329 and 1383. 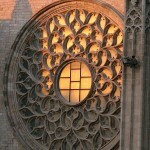 The church is built in beautiful gothic style. The church has since its construction survived an earthquake and a fire, and though some damages were made on these occasions, the church is beautiful today as ever before! Most people coming to Barcelona visit Sagrada Familia, but do not forget this church as it is very nice as well, and it has free entrance.